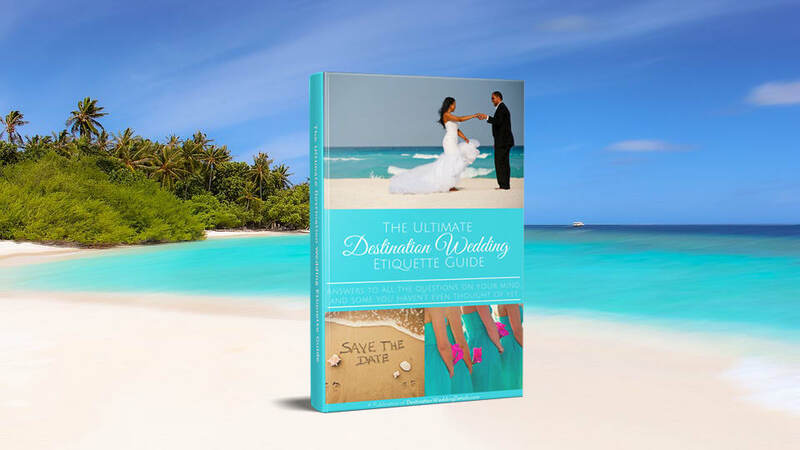 Are you looking for destination wedding bridesmaid gifts that will show your bride tribe how much you appreciate them? 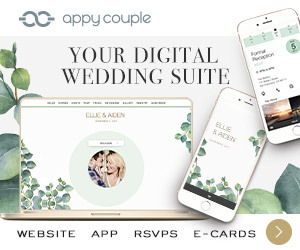 To help inspire you, I rounded up 30 bridesmaid gift ideas that are thoughtful, practical and unique. 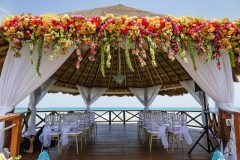 This topic is near and dear to my heart because when I was planning my own destination wedding, I really wanted to spoil my bridesmaids. 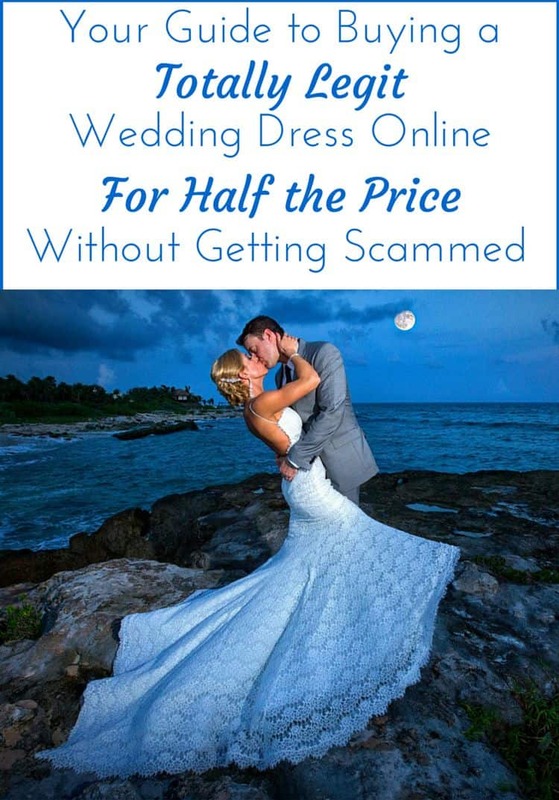 Not only were they taking on the traditional duties of a bridal party (buying their attire, planning showers and bachelor/bachelorette parties, etc..) – they were also investing a lot of time and money to travel to our wedding destination. I felt that the least I could do was give them a nice gift as a token of my appreciation. 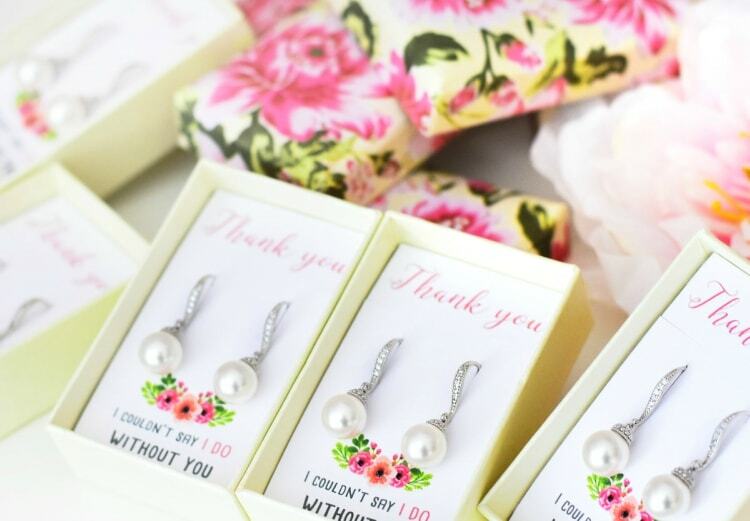 So if you also want to pamper your tribe with thoughtful bridesmaid gifts, but have no idea where to start, this post is for you. 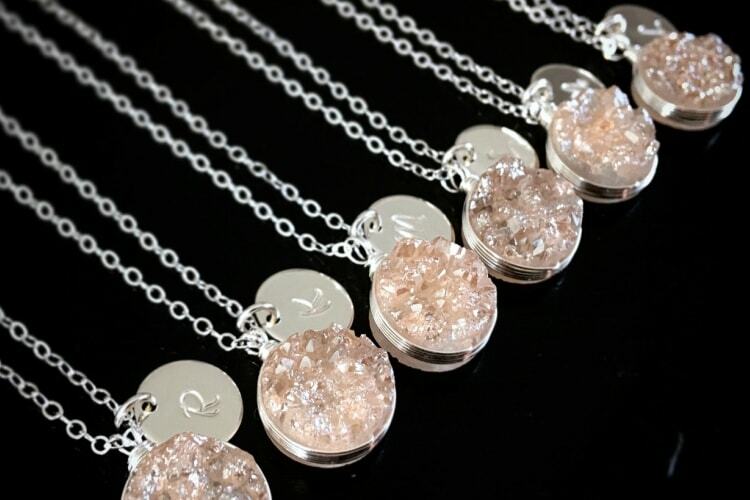 This is one of those classic bridesmaid gifts that don’t go out of style – and for good reason! 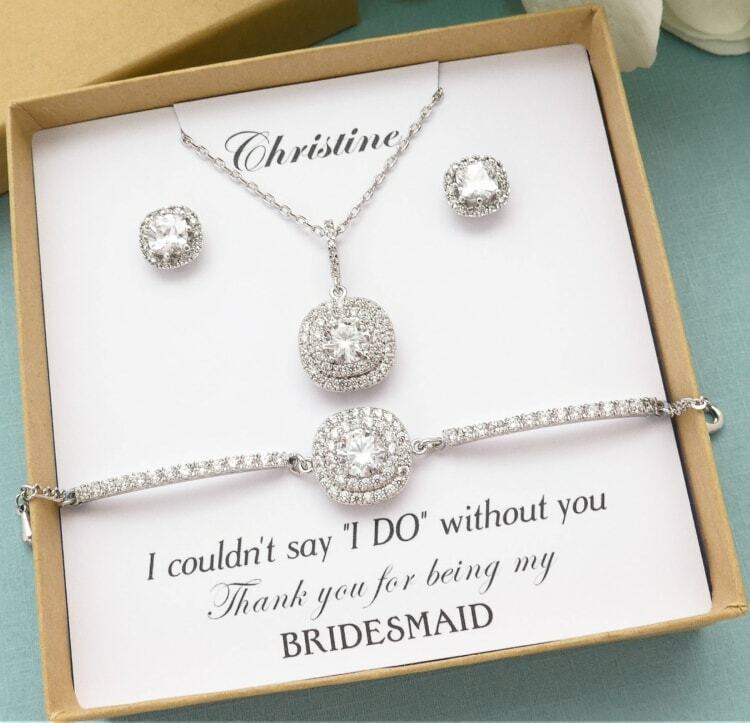 Jewelry is a gift your bridesmaids will enjoy for years to come and is the perfect way to express how much you appreciate their friendship and support. 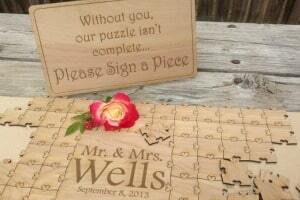 Take it to the next level – personalize that piece of jewelry! Think of it as a sophisticated version of those friendship bracelets/necklaces you and your gals exchanged back in grade school. 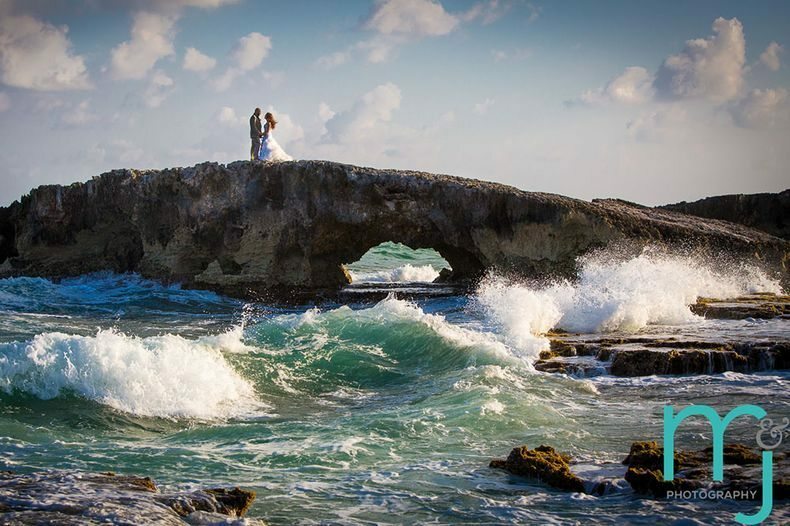 Every time they go to wear it, they’ll be whisked away by memories of the amazing destination wedding they shared with you. 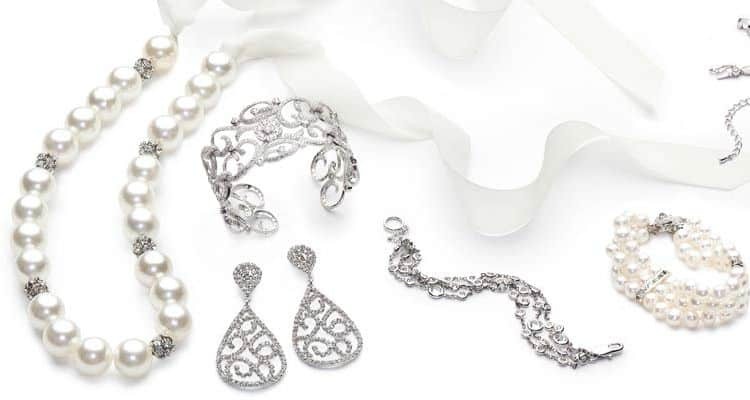 Check out more bridesmaid jewelry on Etsy. 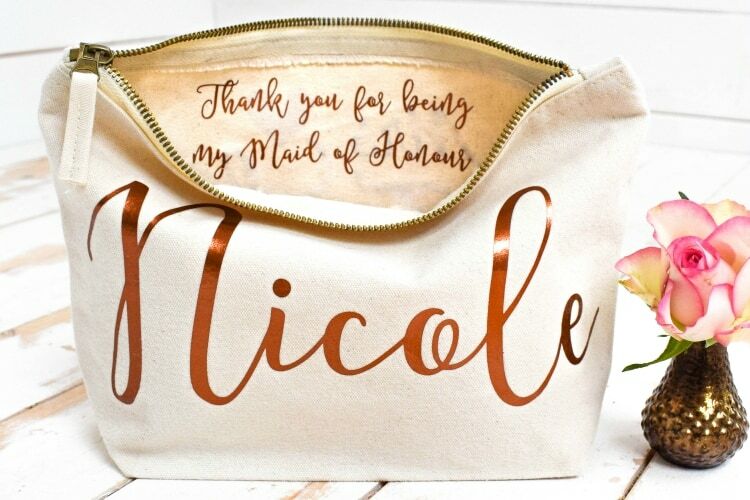 We’re all about destination wedding bridesmaid gifts that are fun, thoughtful, and practical – enter: the personalized makeup bag. 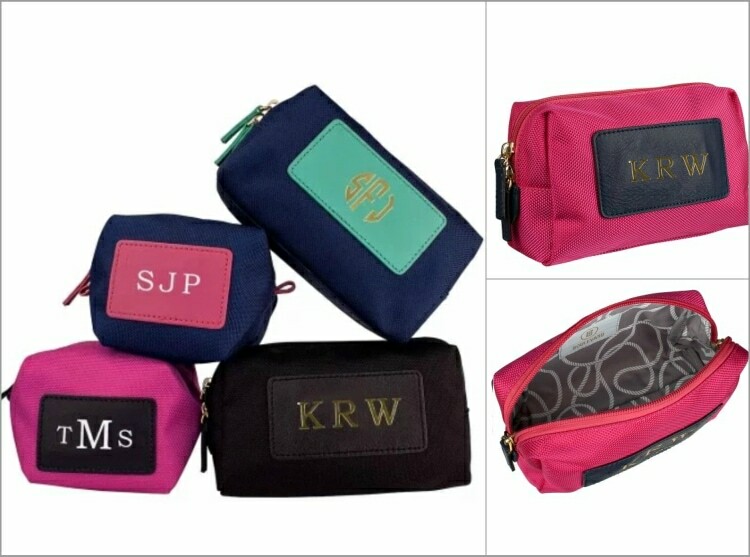 Like jewelry, a makeup bag is a gift that keeps on giving long after you’ve said, “I do.” Add their name, initials or, if you’re feeling frisky, their zodiac sign to up the ante. 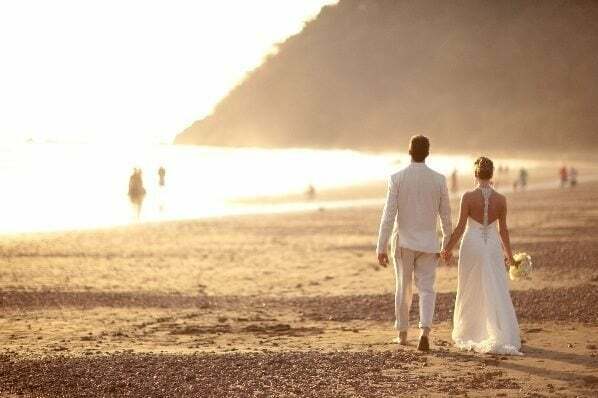 Clutch bags are an absolute must at destination weddings – no more worrying about, “where’d I leave my phone?” or having someone’s ID and lipstick fly out of their purse on the dancefloor. 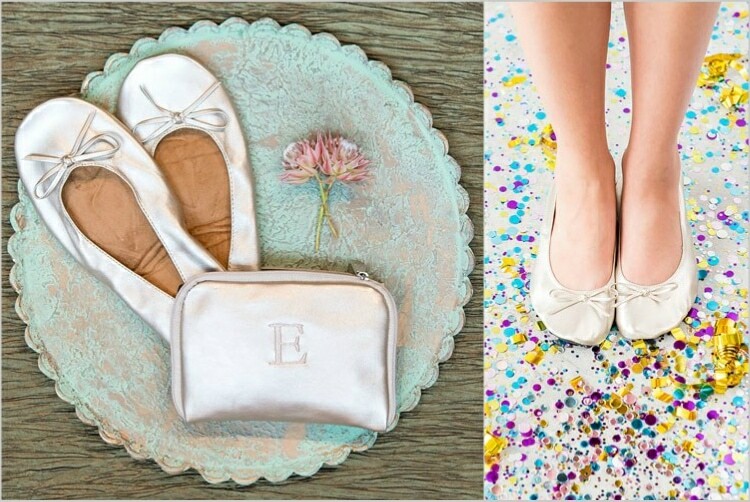 Plus, these pint-sized purses are just another way to add a punch of flair to your bridesmaids’ attire. 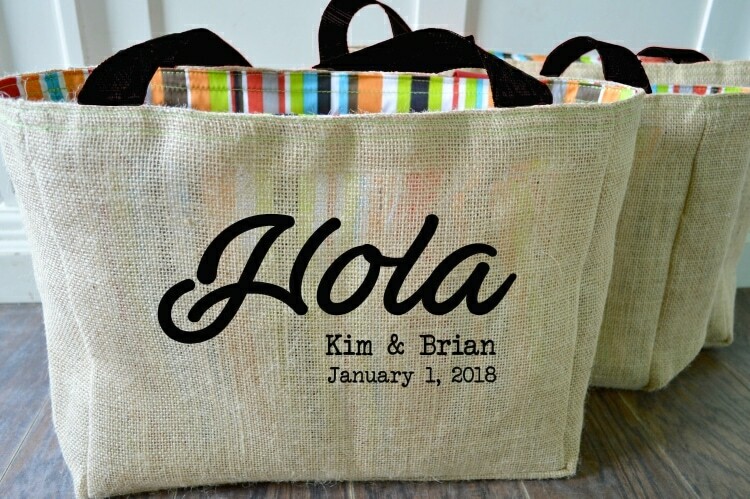 Tote bags are ideal destination wedding bridesmaid gifts because they can double as a welcome bag to stuff miscellaneous items in (ie: mini champagne bottles, flip flops for the dancefloor, and the ever-so-necessary hangover kit). 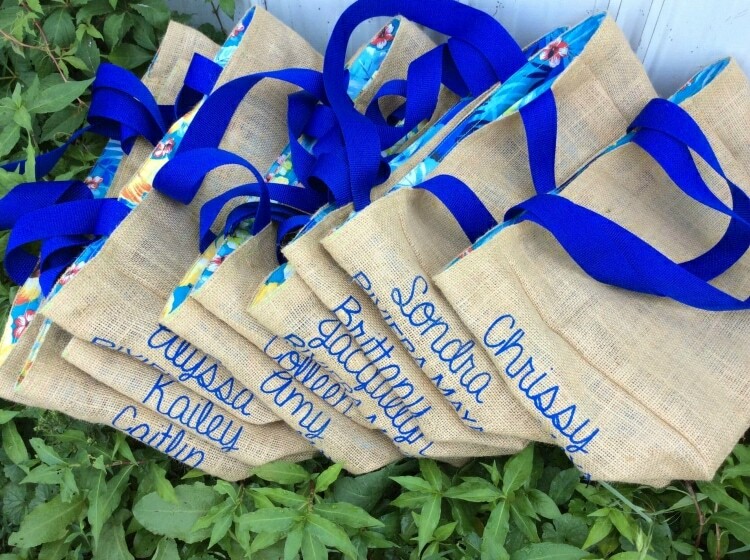 You can have the bags personalized with your BFF’s names, your wedding destination, or get creative with some fun quotes or sayings. A floppy sunhat is something your girls will totally need and may have forgotten to pack — now everyone can enjoy the beach and remain sunburn-free. 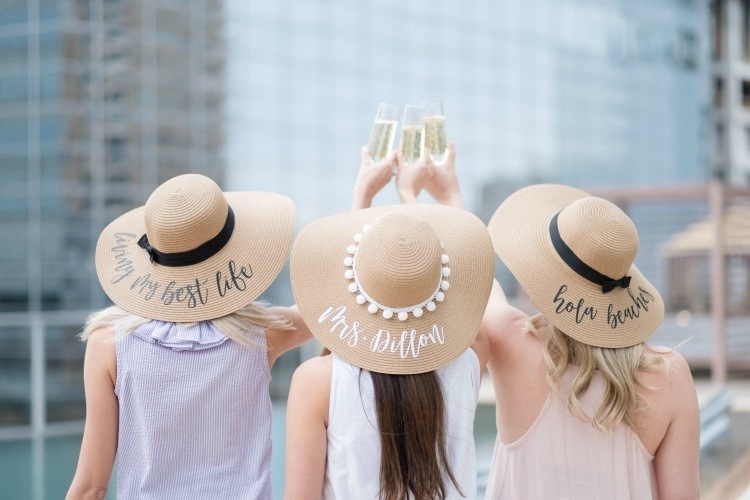 In addition to being practical destination wedding bridesmaid gifts, these personalized floppy hats make for great photo ops! 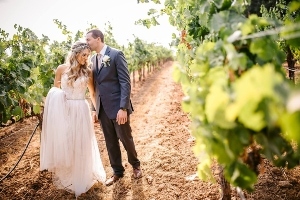 One of the best parts of your wedding day will definitely be the morning spent lounging with your girls, having mimosas on the balcony while getting pampered by the hair and makeup team. 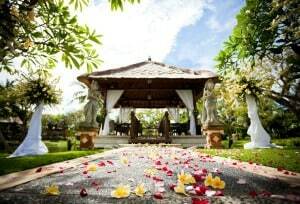 A luxurious set of robes for everyone to relax in completes the vibe. 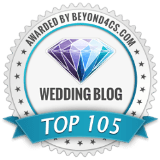 Speaking of getting pampered… your bridesmaids will undoubtedly need a little pick-me-up to nurse their sore feet after a night of dancing, and possibly some under-eye love and aromatherapy after that sixth vodka soda. 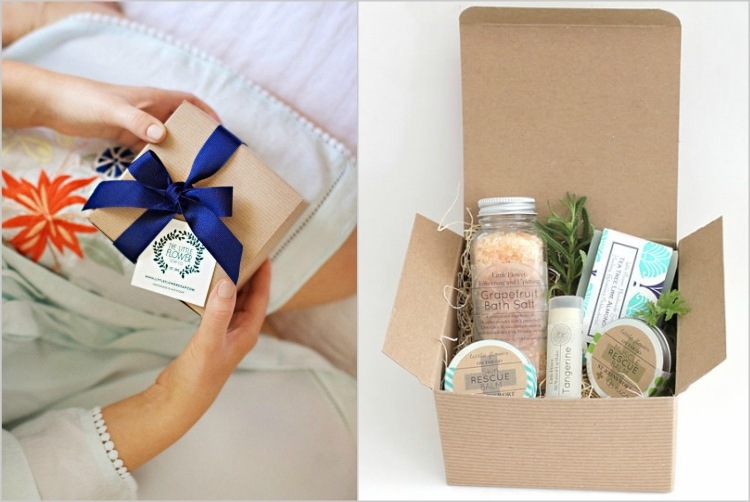 A cute gift box with bath salts, sheet masks, and candles will go a long way. 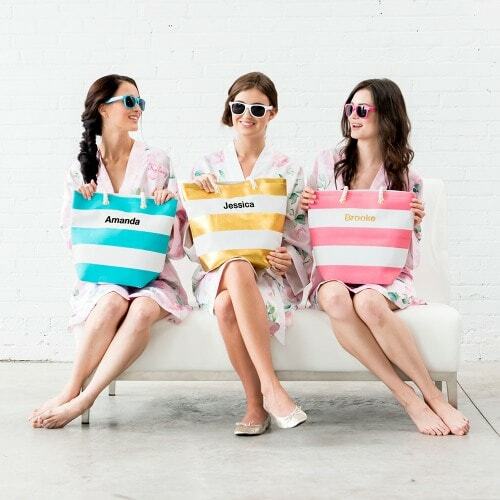 If you’re hosting a beach wedding, a huge stylish towel your gals can sunbathe is a great destination wedding bridesmaid gift – and like much of this list, it’s a practical gift they’ll use again and again. 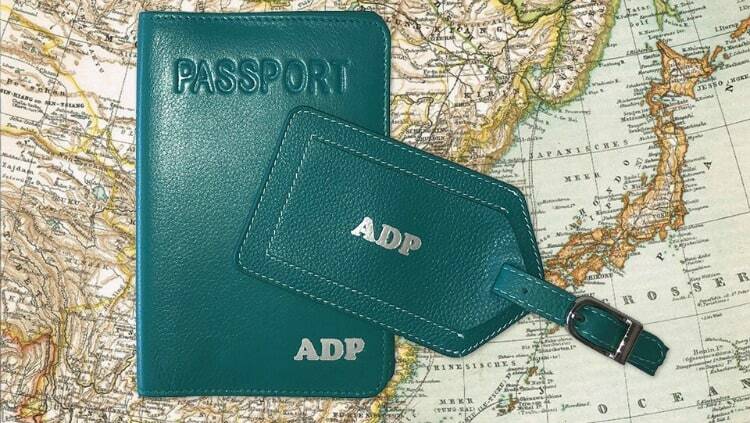 Each time they go on vacation from now on, they can take a little piece of you! I especially love these Turkish towels because they’re soft and lightweight which makes them easier to pack and they dry quickly. 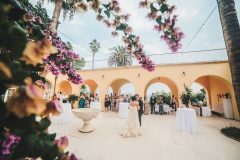 Sandals are becoming a staple at most weddings – because why blister those pedicured toes on the dancefloor? 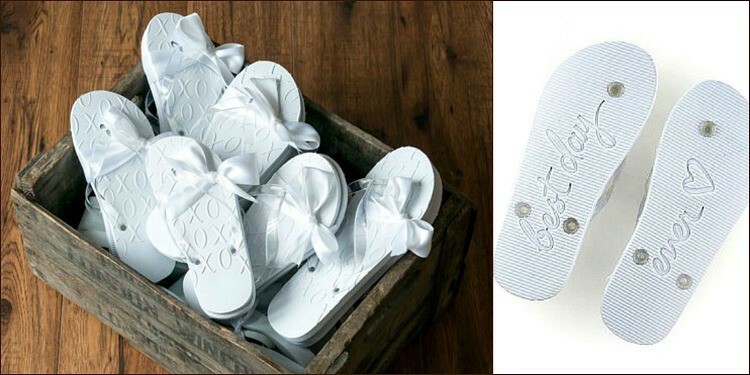 Offer your bridesmaids the gift of comfort with some stylish flip flops, ballet flats or even (my favorite trend) the footless sandal. 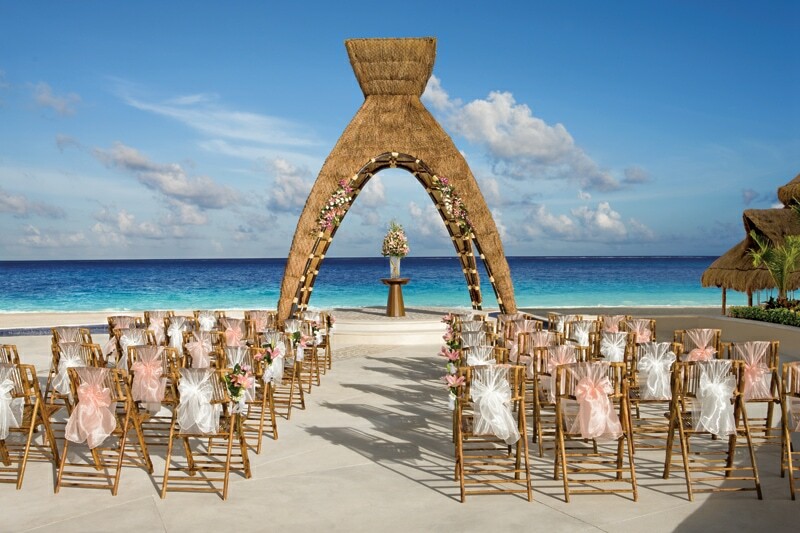 When you plan a destination wedding, it’s about much more than just the big day. 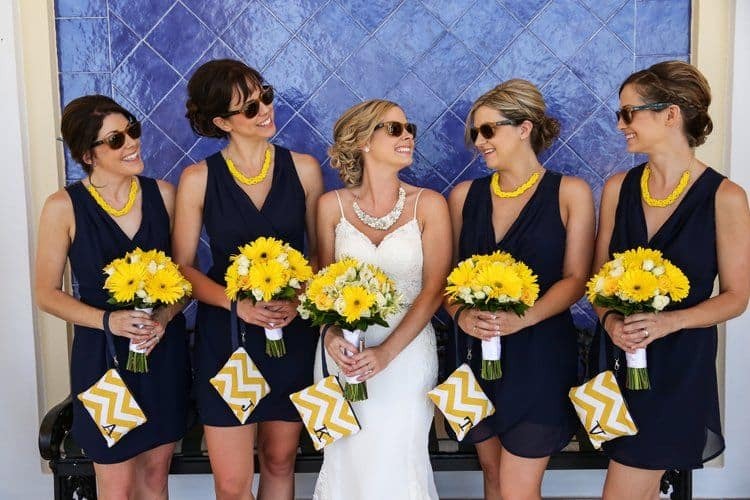 By offering your bridesmaids the gift of stylish travel accessories, you’re acknowledging the lengths they’re going to make it to your wedding. Okay, these bridesmaid gifts are uber specific to beach weddings – but I think we can agree they’re are amazing! Your girls will be so comfortable, they’ll never want to leave the beach! 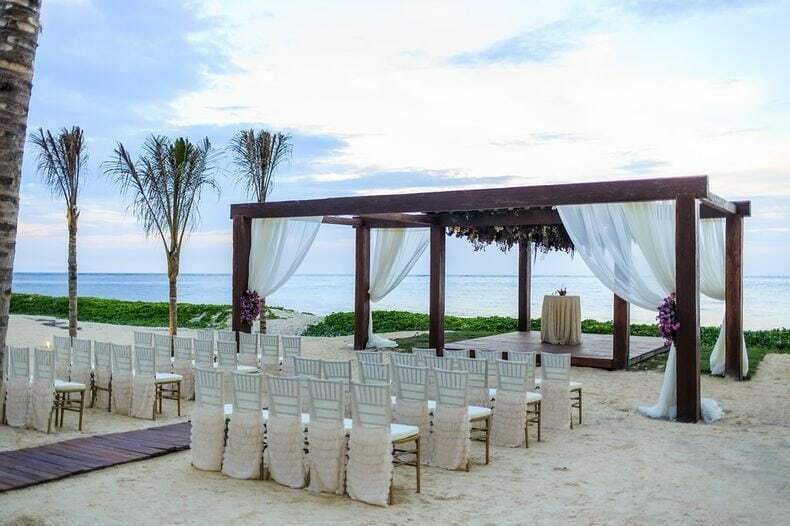 And if there’s drink service… forget about it. 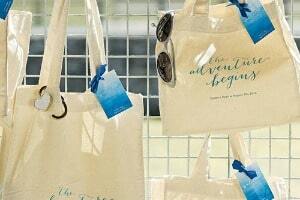 The wet bikini bag is a fun gift you can pair with the folding beach mats and tote bags mentioned above. 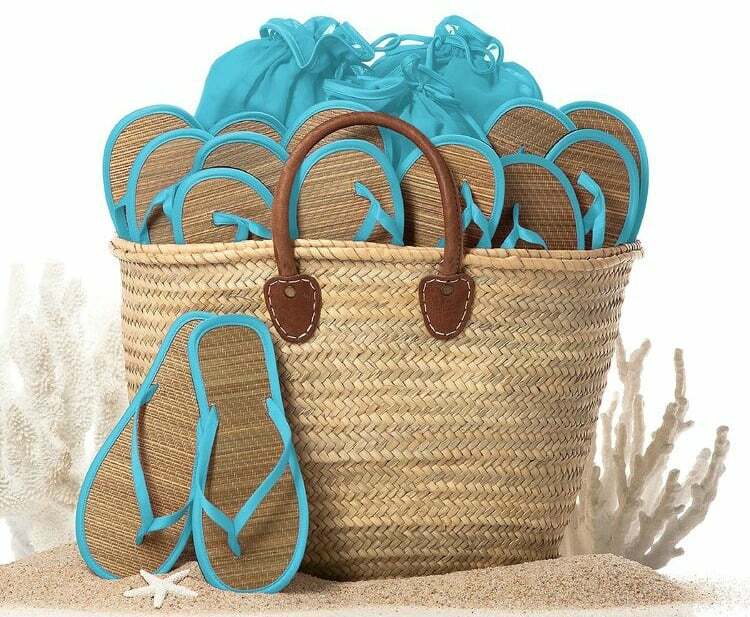 There’s nothing worse than tossing a wet/sandy bathing suit into your beach bag with your cell, keys, snacks or change of clothes. 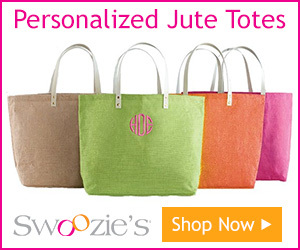 This bikini bag comes complete with an interior zippered pocket to protect your stuff! 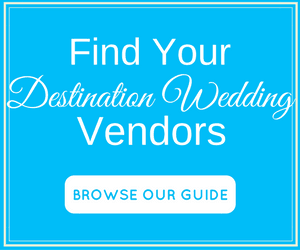 These are SO fun for your bachelorette party, shower, destination wedding… and beyond. 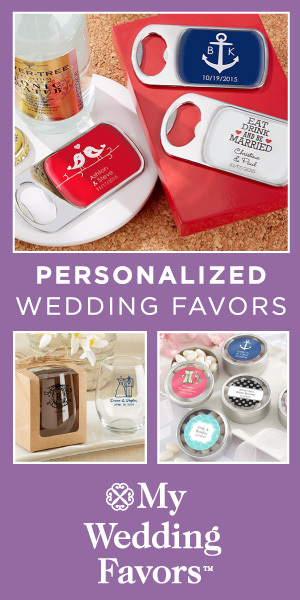 Get creative with the design, or use cute nicknames to make this personalized t-shirt gift that much more fun. Well, you’re right. The personalized tank top is not much different than the t-shirt, except you’re not getting sleeve tan lines! 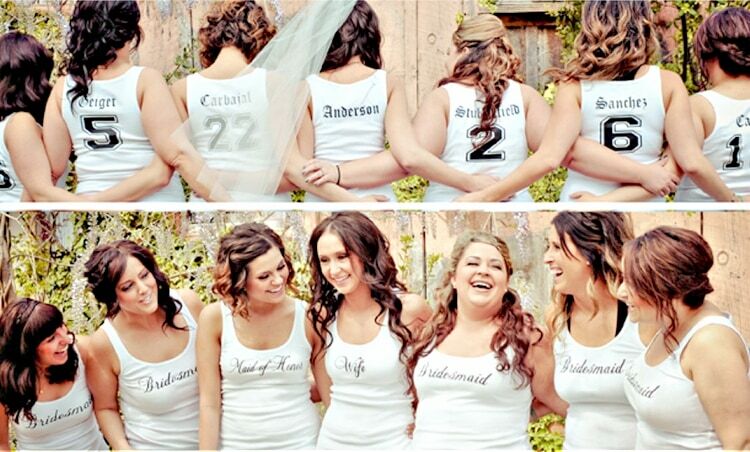 I love this idea: each number on the back represent the number of years you’ve known each bridesmaid. 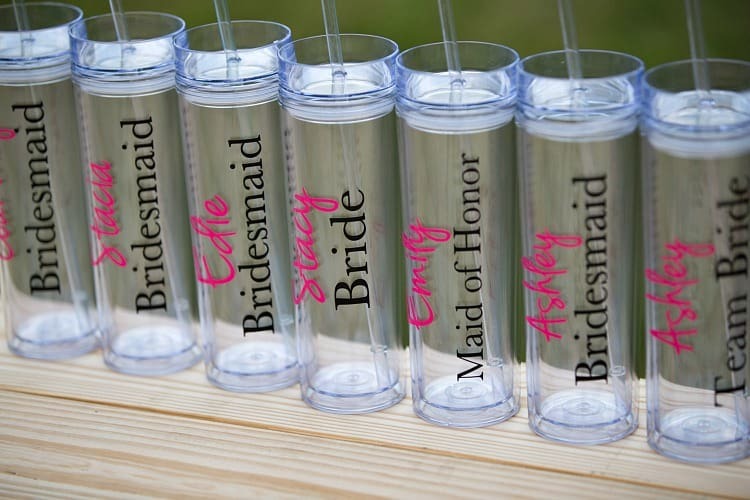 Tumblers are popular destination wedding bridesmaid gifts. 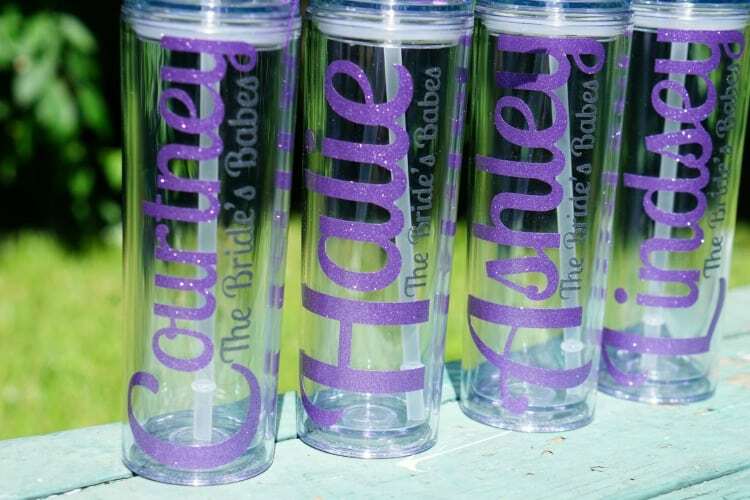 These matching tumblers come in handy whether you’re trying to keep that extra-large mimosa cold on the beach or rehydrating after a night of drinking and dancing. 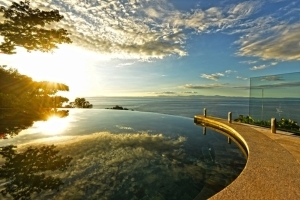 Plus like almost everything else on this list, this is a gift that your friends can use back home and on future vacations. 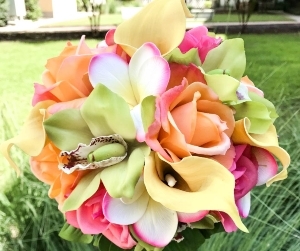 Costa Rica Wedding Getaway Planning Services.